Wishing you a Merry Mancunian Christmas! Manchester is a city that knows how to have fun at any time of year – snow joke! 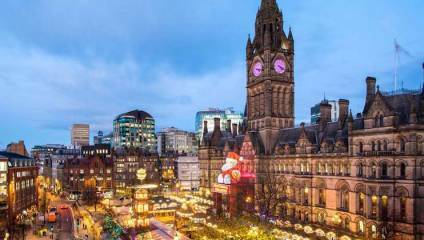 Here are some of the stand-out events in Manchester’s spectacular Christmas celebrations. There are panto’s galore this time of year – but if you’re looking for something a bit special, you can’t ‘Dolittle’ better than this extraordinary musical at the Lowry in Salford. The title role of Dr Dolittle is played by the hugely talented Mark Williams (a.k.a. Ron’s dad, Mr Weasley, in the Harry Potter films). From the producers of Chitty Chitty Bang Bang and The Addams Family, this exciting production promises stunning visual puppetry, all your favourite songs and fun for all the family. Illuminations and animals – what’s not to like about that! If you fancy heading out of the city, then head to Chester Zoo’s magical lanterns festival for a sparkly Christmas experience like no other, and the perfect treat for families looking for some festive fun. Prepare to have your heart broken, pieced back together and then warmed! The People’s History Museum, which is the national museum of democracy, are screening much-loved Christmas classic, It’s a Wonderful Life. We can't think of a more poignant and beautiful location for this iconic story of defiant cheer and solidarity, starring Hollywood legend James Stewart. For more information, see here; to find out about Christmas Markets elsewhere in the UK, check out our top picks here. This town northwest of Manchester has more than enough going on to warrant a visit – from festival-style tepee bars to a huge ice rink in Victoria Square at the centre of the town. Good boys and girls might even bump into Santa in his grotto! The fun ramps up on Saturday 8th December when the Mayor’s annual Christmas Fair takes place, promising music and entertainment, games and fun for all the family.